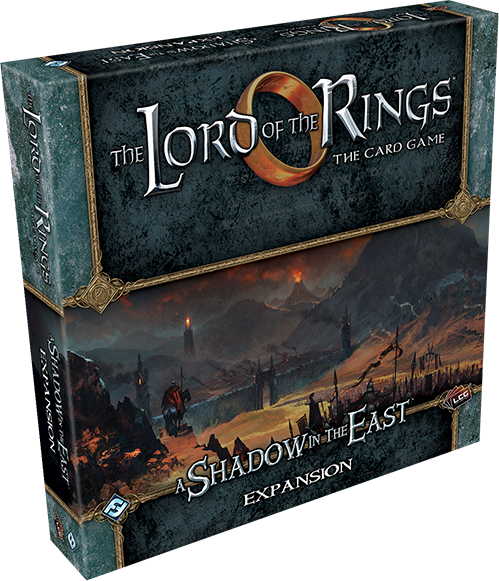 Lord of the Rings LCG is getting an eighth deluxe expansion pack, A Shadow in the East, and it sounds spectacular! We’re heading to Rhûn for this and the subsequent Vengeance of Mordor cycle, and I for one simply cannot wait! The three quests that come in the expansion are all a little reminiscent of the Against the Shadow cycle, with their urban feel and sinister cults, but there is also the added feeling of the oppression of Mordor, with the idea of mysterious ruined temples built in honour of Sauron. Wow! This has been great news, I have to say. It’s always exciting to see more come out for this game, which I have frequently said is my all-time favourite board/card game in my collection. We’re getting new quests of course, and we’re travelling to another new area of the map, so what’s not to like? 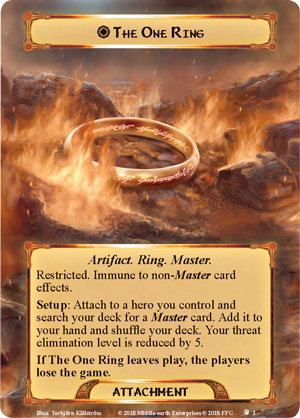 Some very interesting new theme and mechanics coming on the cards we’ve seen spoiled so far – and we’re getting The One Ring once again! I’m not sure whether this new Ring card will make it into my decks (although I’m also wondering whether it will be a stipulation of playing the quests?) as I’m a fairly cautious player at times, and reducing my threat elimination level by 5 to play with it seems a bit too much for me! But I’m sure, in time, I’ll try and experience how it changes things – especially seeing as how there will be new cards that interact with it, as well. The first double-sided Hero card is here, too! 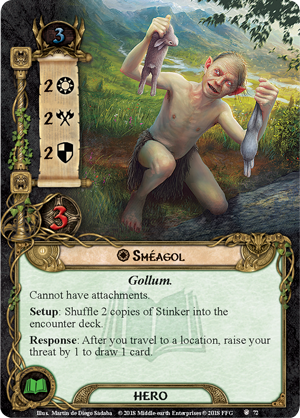 I’m sure I’ve seen fans speculating about the possibility of a Sméagol/Gollum card for years, so I’m sure there are plenty of folks excited by this! With two cards shuffled into the encounter deck that give him a chance to flip to the Enemy side, I can see having the Ring’s ability to counter encounter cards in this way could be quite powerful! He’s otherwise quite decent-looking, and his cost is splendid! Reminds me of the Spirit Glorfindel from back in the day! 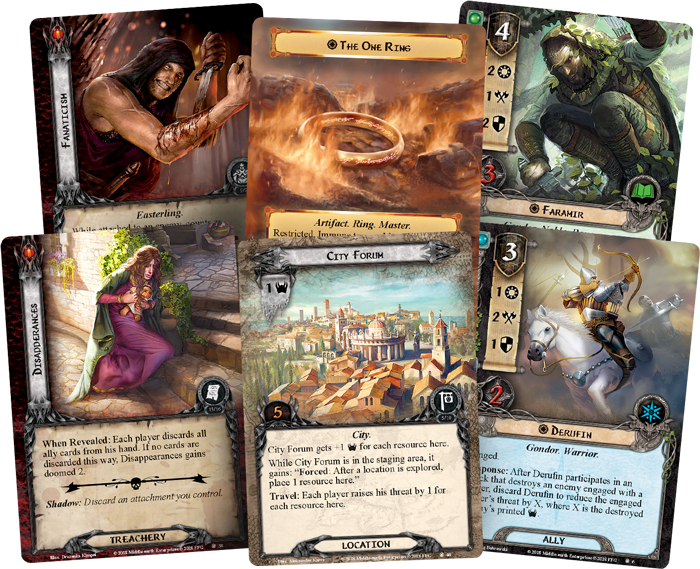 I’m really excited to see a new deluxe expansion – I’ve been concerned for a while now that The Wilds of Rhovanion would be the end of the game in its paper form, as it seems to have a real “last hurrah” feel to it. You can read more about that here, though! There is still some strong speculation online that the language used in the announcement feels a bit final – “it has all led to this” etc – plus the question of just what was happening within the time period the game is supposed to be following, leading many folks to think we could be in for news of the final expansion pack soon. Previous LCGs from Fantasy Flight have come to an end when they have about this much content out there for them, of course. 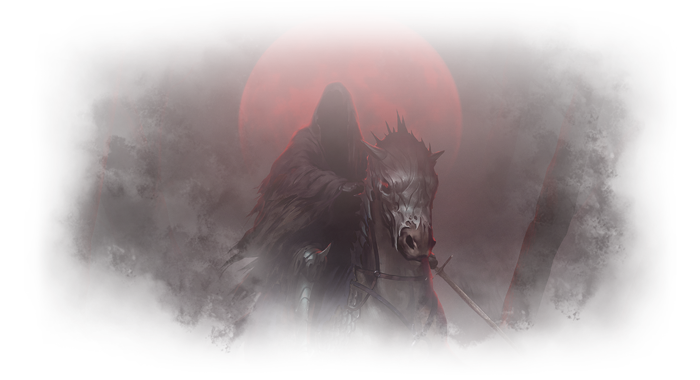 We’re coming to the end of the eighth cycle for the game, which has also included seven deluxe expansions and eight Saga deluxe expansions, as well as eleven standalone expansion packs, not to mention all of the Nightmare expansion packs! There is a heck of a lot of content out there right now for this game, and while the amount of content doesn’t always equal bloat for a game like this, there is nevertheless quite a high barrier to entry at this point, and I wonder if the designers might be feeling the need to draw things to a close. I guess we can but wait and see on this. 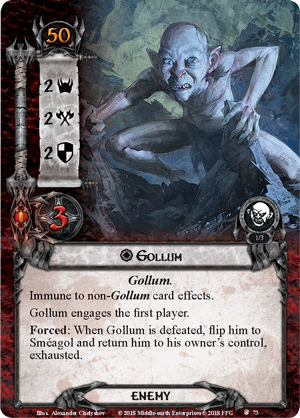 At least we’re in for more Lord of the Rings LCG for a while yet, and I cannot wait to see what we’re going to be up to in this upcoming cycle! I think it might be time to crack out some decks and see how far I can get once more!